Between April and September 2014, the central govt released Rs 13,618 cr to states, against Rs 24,676 cr in the same period last year. 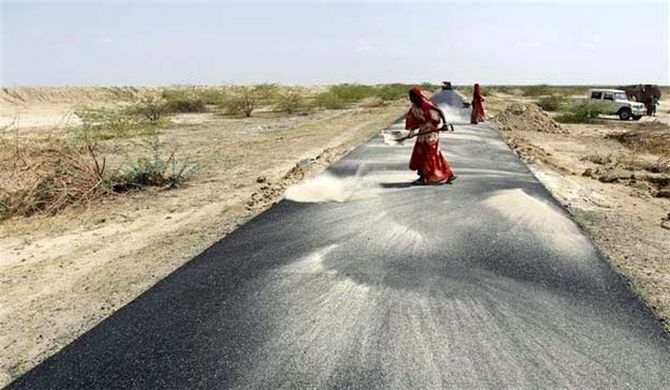 The Union government has severely cut the funds for Mahatma Gandhi National Rural Employment Guarantee Act, one of the largest job-creation programmes in the world, even as it deliberates on framing new norms for it. Compared to last financial year, there has been nearly a 45 per cent reduction - the sharpest since the inception of the scheme - in funds released by the Centre to states till September for Mahatma Gandhi National Rural Employment Guarantee Act (NREGA). Between April and September 2014, the central government released Rs 13,618 crore to states, against Rs 24,676 crore in the same period last year. Launched in 2005, the NREGA overhauled the labour market by promising 100 days of work a year to each rural household at a pre-determined minimum wage rate. The daily wages under the scheme, as par revision in April 2012, was between Rs 122-189. In addition, the former UPA government further increased wages in Bihar, Jharkhand, Andhra Pradesh, Mizoram, Nagaland, Sikkim and Tripura. In contrast, the wages for casual labourers across sectors varies between Rs 80-220 per day, with the agriculture sector accounting for some of the lowest wages. 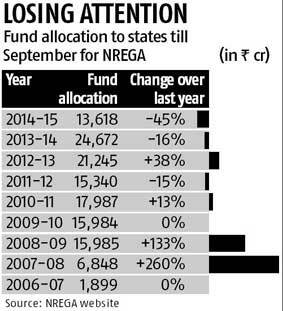 Statewise allocation of funds in show how the Centre has squeezed the scheme this year. In Maharsahtra, the fund allocation came down to Rs 136 crore till September this year against Rs 1,152 crore in the same period last year. West Bengal and Karnataka have also been at the receiving end of this cut. While in the former, the fund release reduced from Rs 2,214 crore last year to Rs 1,782 crore, in the latter, it came down from Rs 774 crore to Rs 439 crore. A fund crunch in the district level is making its effects felt. "The fund allocation under the NREGA has gone down substantially since the new government come to power," said a district official in West Bengal. Higher prevailing wages in NREGA had affected the wages in sectors like real estate and agriculture. According to Pradeep Sureka, a real estate developer in Kolkata, the average daily wages of casual labourer has increased at the rate of 15-20 per cent annually over the last few years. At present, an unskilled labourer in the real estate sector earns Rs 200 per day, while the wages of semi-skilled or skilled labourers is between Rs 500-600 per day in the state. "Getting labourers in the agriculture sector had been very difficult over the last few years, as the wages are much lower than under the NREGA,"said Pranab Chatterjee, a professor at Bidhan Chandra Krishi Viswavidyalaya. According to the proposals of the central government, plans are afoot to link the scheme to agriculture linkages. According to a government note, if at least 60 per cent of the works to be taken up in a district in terms of cost is for the creation of productive assets linked to agriculture and allied activities through development of land, water and trees, it will bring at least Rs 25,000 crore of investment into agriculture. This apart, other changes would lead to deploying of an approximate Rs 8,000 crore for creating infrastructure like minor irrigation structures, according to the note. The central government has also been considering an amendment aimed at restricting the NREGA to the country's poorest 200 districts.